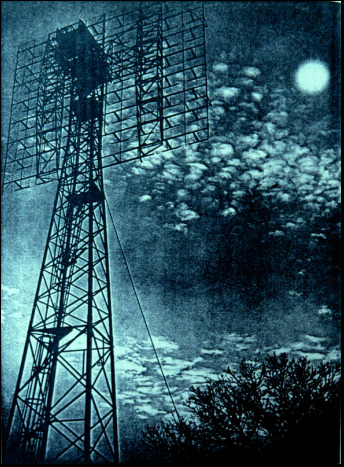 On January 10, 1946, a small group of scientists at Camp Evans in Wall, NJ, using a modified SCR-271 bedspring radar antenna and amping up the power, broadcast a series of radar signals towards the moon and each time picked up an echo 2.6 seconds later - the time required for light to travel to the moon and back. In our post-moonwalk era, when amateur radio enthusiasts with powerful transmitters, sensitive receivers, multi-element antennas, and moon trackers can establish two-way communication using the moon as a reflector in their own back yards, it may be difficult to recapture the excitement of that moment; yet in some ways it was an even more stunning achievement, for it demonstrated that the earth's atmosphere could be pierced and that communication with extraterrestrial bodies was possible. It marked the birth of radioastronomy and initiated the age of space exploration. In a tacit salute to Project Diana, space scientists have continued the tradition of naming their projects after Greek and Roman gods and goddesses. Efforts to mount fullscale 40th and later 50th anniversary commemorations never got off the ground. With the burgeoning popularity of what is now known as Earth-Moon-Earth (EME) communication or moon-bounce, however, the ﻿Project Diana story﻿ has once again found its way to the public eye - on ﻿Wikipedia﻿ and on a ﻿website﻿ maintained by the ﻿InfoAge World War II Museum﻿ (which features many resources donated by David Mofenson and Cindy Stodola Pomerleau), for example. Robert Buderi's book ﻿﻿﻿The Invention that Changed the World﻿﻿﻿, dealing mostly with the MIT Rad Lab, takes a 3-page detour to describe Project Diana at Camp Evans, because no history of radar would be complete without this "Army coup," as he called it. Episode 11 of Neil deGrasse Tyson's update of Cosmos includes a tribute to Project Diana and several minutes of footage from a contemporary newsreel. ​What is less well known is the human drama, the story of the men who made Project Diana possible and the chemistry among them that made it succeed. This Website is the story of these men, in their own words and the words of colleagues, friends, and family.